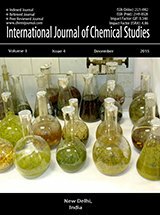 International Journal of Chemical Studies is a peer reviewed open access journal. Prime Focus of the Journal to publish articles related to the current trends of research in chemistry. Abbreviated Title: Int. J. Chem. Stud. This Journal provides the platform established with the aim of motivating the researchers in the research and development of chemical sciences. Abstracting and Indexing information: Journal is in process to index with Index Copernicus, Ulrich's International Periodical Directory, Google Search, Google Scholar, Indian Science, PubsHub, Libraries Directory and Many More important databases. The journal publishes chemical, pharmaceutical and biomedical review and research articles which include: Organic Chemistry, Physical Chemistry, Analytical Chemistry, Polymer Sciences, Medicinal Chemistry, Natural Chemistry, Biochemistry, Analytical Research Works, QSAR Studies, Nanotechnology, Biotechnological Research Works, Method and Process Development, Drug Development and etc.